Keep these simple tips in mind and use this guide to determine which LADOT route will serve you best. Pick up the specific DASH or Commuter Express brochure for the route you will be using. Stops are clearly marked on each route map. Board the bus at any place along the route that is marked with an LADOT bus stop sign displaying either a DASH or Commuter Express logo. Many Commuter Express stops are shared with other services that are part of Metro, the LA County's transportation system. These signs are marked Metro on top with route numbers using that stop listed below. When the bus approaches, check the sign above the windshield for the route number and destination. Pay your fare or use a TAP card upon boarding. For Commuter Express riders, if you need to purchase an Interagency transfer, pay for it using your TAP card upon boarding the second bus. About one block before your bus arrives at your stop, signal the driver to stop by pulling the bell cord overhead. The driver will stop at the next bus stop sign. If you are unsure of where you need to depart, the driver will be glad to assist. Refer to your specific route brochure for exact bus stop locations and departure times. Times are approximate and may vary due to traffic and weather conditions. Please plan your trip accordingly. As a courtesy to other passengers, LADOT does not allow smoking, eating, drinking or loud radio playing while on the bus. Be courteous to other passengers by keeping the volume low or using headphones with any radios. Do not distract the drivers with unnecessary conversation and activity. For more information, please see our Riders' Code of Conduct page. Please reserve the forward-most seating on the bus for elderly or mobility impaired passengers. For the latest information on route detours or other service notices, check the News and Alerts section, or sign up to receive email blasts or Tweets specific to the LADOT route(s) you use. All DASH routes are the same fare. The cash fare is 50¢, 25¢ for seniors/disabled. The DASH 31-Day Pass offers unlimited riding on all DASH routes for only $18. Free transfer with an LADOT Commuter Express 31-Day Pass, DASH 31-Day Pass or EZ transit pass. No DASH to DASH transfers except on Pueblo del Rio to/from Southeast, and LaBrea-Wilshire loop on Fairfax. Purchase a DASH 31-Day Pass or place stored value onto a TAP card at the LADOT Transit Customer Service Center located in the LA Mall in downtown Los Angeles (201 N. Los Angeles), at selected TAP retailers, by phone or ont the web. If you do not have a TAP card call the LADOT Transit Customer Service Center at (213, 310, 323, or 818) 808-2273, or order on the web at ladottransit.com. Locate the TAP retailer selling the DASH 31-Day Pass convenient to you by calling the LADOT Transit Customer Service Center at (213, 310, 323, or 818) 808-2273. Stored Value (cash) can be purchased at any TAP retailer as well as ticket vending machines in Metro rail stations. Phone and web purchases must be tapped within 30 days of purchase or they will no longer be available. The 31-Day Pass must be tapped on a DASH bus while stored value (cash) can be tapped on any bus or at Metro rail stations. Phone or web purchases require three days for the pass or stored value to be uploaded to the TAP card and recognized on the bus, with the upload completed when you tap the card on the DASH bus. Pay when you board the bus by placing the exact change in the farebox or by placing your TAP card by the validator located by the farebox. The validator will indicate if your TAP card has a valid DASH, Commuter Express pass, EZ transit pass or stored value (cash) by a green or red light. With a green light take a seat and enjoy the ride. If the light is red, please hold the card by the validator again. If the light remains red there is no valid fare on the TAP card and you must pay the cash fare. While no longer sold, paper DASH tickets will still be valid. Just place them into the farebox as you do now. Tickets cannot be redeemed for cash or converted to the TAP card. Commuter Express operates on a zone system with fare payment based on how far you travel and how many zones you ride. There are five fare zones, identified as Base and zones 1-4. All Commuter Express 31-Day passes and Trip Tickets are sold on the TAP Card. Commuter Express routes 142, 431, 437, 438, 534 and Bunker Hill operate in only one zone. Routes 419, 573 and 574 in two zones, routes 409, 422, 448 and 549 in three zones, route 423 in all five zones. Commuter Express 31-Day Passes and Trip Tickets are sold by the number of zones: Base and 1-4. If you travel in more zones than your pass or ticket, you will need to pay the difference in cash or with stored value (cash) on your TAP card (the difference will be automatically deducted from stored value (cash)). The cash difference is calculated by comparing the one-way cash fare shown on the table for the zone of your pass or ticket with the number of zones you will be travelling. The EZ transit pass is also sold by zone (Base to 10). The EZ transit pass zones Base to 4 are equal to the Commuter Express zones Base to 4. EZ transit zones 5 and higher are equal to Zone 4 for Commuter Express. If you travel in more zones than your EZ transit pass allows, the cash difference is calculated by comparing the one-way cash fare with the number of zones you are travelling. Valid Metrolink tickets and passes are equal to the Commuter Express Base fare ($1.50 credit toward the fare). Commuter Express 31-Day passes are valid on all LADOT transit services, including DASH. With a Commuter Express 31-Day Pass, transfer to any other Commuter Express bus with no additional fare when the number of zones on the pass are equal to or greater than the zones of travel on the second route. If the number of zones on the second route exceed the number of zones on the pass, the difference will be deducted automatically from stored value (cash) on the card. Otherwise you must pay cash. The transfer procedure when paying with an EZ transit pass is the same as paying with a Commuter Express 31-Day Pass. The Commuter Express 31-Day Pass also allows you to transfer to any DASH route free. If you pay with a Commuter Express ticket on the first bus, and you have stored value (cash) on your card, the cost of the transfer (varies based on the transit service to which you are transferring) will be deducted automatically when you board the second bus. You must have stored value (cash) on your TAP card to buy a transfer. You will request (and pay for) your transfer on the second bus (bus you are transferring to) not the first bus you transferred from. Cash will no longer be accepted as payment for transfers. If you are transferring from Commuter Express to Metro rail, you will need to have a TAP card, pay for the Interagency Transfer with stored value (cash) on the card and have the transfer loaded onto the card by the driver. After paying for your Commuter Express fare, ask the driver for an interagency transfer. The driver will load the transfer onto your TAP card and ask you to tap your card a second time. At the rail station, place your TAP card on the turnstile. If you are transferring from Commuter Express to Metro bus or a municipal bus line that accepts the TAP card, you can ask the driver for the Interagency Transfer to be loaded onto your TAP card. Purchase a Commuter Express 31-Day Pass, Commuter Express Trip Tickets (20) or place stored value (cash) onto a TAP card at the LADOT Transit Customer Service Center located in the LA Mall in downtown Los Angeles (201 N. Los Angeles, Ste 16), at selected TAP retailers, by phone or on the web. Locate the TAP retailer selling the Commuter Express 31-Day Pass or Trip Tickets convenient to you by calling the LADOT Transit Customer Service Center at (213, 310, 323, or 818) 808-2273, or check to see when and where our mobile sales team will be in your area. Stored Value (cash) can be purchased at any TAP retailer as well as ticket vending machines in Metro rail stations. Phone and web purchases made at taptogo must be tapped within 30 days of purchase or they will no longer be available. The 31-Day Pass and Trip Tickets must be tapped on a Commuter Express bus while stored value (cash) can be tapped on any bus or at Metro rail stations. Phone or web purchases from taptogo require three days for the pass or stored value to be uploaded to the TAP card and recognized on the bus, with the upload completed when you tap the card on the DASH bus. If you ride Commuter Express route 142, 431, 437, 438, 534 or Bunker Hill, simply pay your fare in cash or place your TAP card (either side) close to the validator located by the farebox as you board. The validator will indicate by a green or red light if your TAP card has a valid Commuter Express pass or Trip Ticket or EZ transit pass that matches the zone of the Commuter Express route you are riding. If the light is red, please hold the card by the validator again. If the light remains red there is no valid fare on the TAP card. You must pay the cash fare. If the light remains red because the zone of the pass/ticket does not match the zone of the route, the validator will show the amount owed. If you have stored value (cash) on your TAP card, it will automatically be deducted. If you do not have stored value (cash) on your TAP card, you must pay the difference in cash. If you ride Commuter Express route 409, 419, 422, 423, 448, 573 or 574, there is a different procedure when you board the bus. At the beginning of the route the driver sets the validator to the highest zone number for the route, lowering it as the bus enters each new zone. To ensure you pay the right fare, inform the driver of your destination BEFORE you pay in cash or use your TAP card. If you are traveling to the last zone on the route and your Commuter Express pass or ticket or EZ transit pass matches that zone, simply place your TAP card (either side) close to the validator located by the farebox as you board. You will get a green or red light as described above. If you are NOT travelling to the last zone on the route you must inform the driver your destination PRIOR to placing the TAP card by the validator. This will avoid you getting a red light because the zone on your Commuter Express pass or ticket or EZ transit pass did not match the zone set on the validator. The driver will reset the zone to your destination and after indicating the change has been made you will be able to tap your card by the validator. You will get a green or red light as described above. The same procedure must be followed for those who pay with cash or stored value (cash) on their TAP card. Otherwise an incorrect amount may be charged and the driver cannot reverse the charge. $2 in fare value for group trips. Taxis use a metered rate. You may use up to $12 of fare value from your Cityride card towards your taxi fare. You cannot use fare value from your Cityride card to tip the driver. 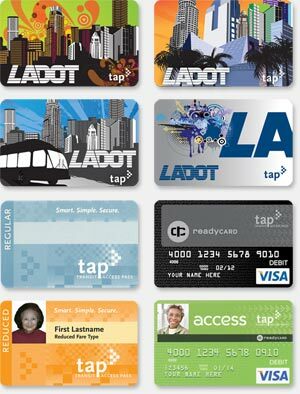 There are several different types of TAP cards including the blue and orange TAP cards, four card designs issued by LADOT, the green Access card and the black Readycard. In addition to LADOT and Metro, other transit agencies in Los Angeles use the TAP system. However, the only fare products that are valid on a bus are those accepted by the bus system you are riding. For example, a TAP card with a Metro Day Pass is not accepted on any LADOT Commuter Express or DASH bus, and a LADOT Commuter Express pass is not valid on Metro. A TAP card cannot be used to pay another person's fare even if there is enough stored value (cash) on the card. People who are 62, 63 or 64 years old who are using stored value (cash) on an orange TAP card to pay the LADOT DASH or Commuter Express fare will be charged the full fare as the age for senior eligibility for LADOT is 65. Get a TAP Card, and place a Commuter Express or DASH 31-Day Pass, 20 Commuter Express Trip Tickets or stored value at the LADOT Transit Customer Service Center located in the LA Mall in downtown Los Angeles (201 N. Los Angeles), at selected TAP retailer, by phone or on the web. If you do not have a TAP card call the LADOT Transit Customer Service Center at 213, 310, 323, or order on the web at ladottransit.com. Locate the TAP retailer selling the DASH or Commuter Express 31-Day Pass convenient to you by calling the LADOT Transit Customer Service Center at (213, 310, 323, or 818) 808-2273. Stored Value (cash) can be purchased at any TAP retailer as well as ticket vending machines in Metro rail stations, but not all retailers sell LADOT fare products. Phone and web purchases made at taptogo must be tapped within 30 days of purchase or they will no longer be available. The 31-Day Pass and Trip Tickets must be tapped on a DASH or Commuter Express bus while stored value (cash) can be tapped on any bus or at Metro rail stations. Phone or web purchases from taptogo require three days for the pass or stored value to be uploaded to the TAP card and recognized on the bus, with the upload completed when you tap the card on the DASH or Commuter Express bus. Contact taptogo.net or call (866) 827-8646 (TAPTOGO) Monday-Friday, 8AM to 5PM. Contact taptogo.net or call (866) 827-8646 (TAPTOGO) Monday-Friday, 8AM to 5PM . Why is LADOT doing TAP? TAP has a number of benefits for LADOT riders. Overall, the TAP card offers riders greater convenience for paying their LADOT fare. TAP offers more payment options and allows riders to better match their travel to the best (and most cost effective) fare payment method for them. With TAP there is no need to have exact change. For riders using more than one transit system, the TAP card with an EZ transit pass or stored value (cash) provides the convenience of having just one card to use no matter how many different transit services are used. Riders will be able to register their card, ensuring the card balance is protected if the card is lost or stolen. Riders with the card will board faster and get to their seat quicker. There are four different designs for the LADOT TAP card. Is there any difference between them? All four LADOT TAP card designs function exactly the same. What is the difference between the new LADOT TAP cards and the TAP card that is blue? Each of the new LADOT TAP cards work exactly the same as the blue TAP card. You will be able to load the LADOT card at the LADOT Transit Customer Service Center (located in the LA Mall in downtown Los Angeles, 201 N. Los Angeles, Ste 16), selected TAP retailers, TAP vending machine at Metro stations, online or by phone. However, the fare product to be loaded must be available from that retailer or ticket vending machine. Stored value (cash) is available at all locations. See the LADOT transit website for times and locations of our Mobile Sales Van. Is there a senior/disabled, reduced fare LADOT TAP card? Not at this time, as LADOT does not offer senior/disabled 31-Day passes or Trip Tickets. Elderly and disabled customers should use the orange TAP card and place cash value or an EZ transit pass on it. They may also place a 31-Day DASH Pass, Commuter Express Pass or Trip Tickets at the regular price. Can I still order LADOT fare media (Commuter Express 31-Day Pass and tickets, DASH 31-Day pass) at the LADOT Transit Customer Service Center? All TAP transactions such as loading passes, Trip Tickets and stored value (cash) onto a TAP card can be made when you come into the store. If you order by phone or via the LADOT Transit website, we can process your order by encoding a LADOT TAP card and mailing it to you. If you already have a TAP card, your order must be processed by the TAP Service Center, at www.TAPTOGO.net or 1-866-TAPTOGO. Can I load an EZ transit monthly pass onto a LADOT TAP card? Yes, the monthly EZ transit pass can be placed onto the LADOT card, with the sticker placed on the front of the card. But, if you are senior/disabled you will not be able to load a reduced fare EZ transit pass (monthly or annual) onto the LADOT card. This can only be done on the orange TAP card. Can I pay for an Interagency Transfer with stored value on my TAP card? Yes, if you paid the regular fare with the TAP card. You cannot, however, pay the regular fare in cash and use the TAP card to pay for the Interagency Transfer. I had purchased a Commuter Express 31-Day Pass (or Trip Tickets, stored value (cash)) on my new TAP card, then did not use it for 30 days. When I went to use it on the bus, the validator indicated red. What happened to my pass? If the fare product was purchased on the web or by phone, the fare product must be activated by placing the card by a Commuter Express validator within 30 days of purchase. If not activated within 30 days of purchase, the fare product will not be available for activation, and the card will be read as No $/Pass. Call the TAP Service Center for assistance. How do I know how much value is left on my TAP card? When you tap the card by the Validator, hold it for a second or two and you will see the remaining balance. Can I pay a part of the fare with stored value and part in cash? I have an ASI card (TAP Card). What do I do now? You still ride free. Just tap your card by the Validator by the farebox. You no longer have to show your card to the driver. I have an Access Card with a PCA logo on it. Do I tap the card twice? No, PCAs must pay a fare. The qualifying age for a senior getting a TAP card is 62 but the LADOT discount for a senior is 65, do I get the discount if I have a TAP card? Riders who are 62, 63 or 64 years of age and have an orange TAP card will have the full fare deducted if they are paying with stored value (cash) from their card. If they have a reduced fare EZ transit monthly or annual pass, the validator on the bus will show a green light. Can I allow someone else to use my card, or pay for my child with my TAP card? Unfortunately no, and it is to protect riders from accidently tapping twice and having two fares deducted. The card has a time feature that is set at 7 minutes which means it cannot be used again for 7 minutes of the first tap. How does the Balance Protection work? When you register the card your balance is protected if the card is lost or stolen. You will be issued a new card with the last balance (including a pass) on the card restored. Register your TAP card at taptogo.net. Can the TAP card alter other cards in my wallet? It will not impact a credit/debit card with a magstripe, but we do suggest keeping the TAP card away from any other smart card you have in your wallet/purse. How long will my TAP card last? It is designed to last 3 years, when it will expire. At that time, it will need to be replaced (and the customer will need to pay a fee for the replacement). The Cardholder License Agreement is available at Taptogo.net. Can I use a personal check at the LADOT Transit Customer Service Center to buy a LADOT pass or Trip Ticket or place stored value (cash) on my TAP card? You can pay with a personal check if you are buying a LADOT fare product (Commuter Express 31-Day Pass or Trip Tickets, DASH 31-Day Pass) and it is placed onto a LADOT TAP card. You may not pay by check if you are using the blue or orange TAP card or adding stored value to any type of TAP card. We understand this may sound confusing but the LADOT Transit Customer Service Center accepts personal checks for purchase of LADOT fare products, but the Metro and the TAP Service Center do not, so all transactions involving stored value (cash purse), or Metro fare products must be transacted in cash or by credit/debit card. How do the Commuter Express monthly pass and Trip Tickets work with the fare zones on Commuter Express? What about stored value? Commuter Express operates on a zone system with fare payment based on how far you travel and how many zones you ride. There are five fare zones, identified as Base and zones 1-4. All Commuter Express monthly passes and Trip Tickets are sold on the TAP Card. Commuter Express routes 142, 431, 437, 438, 534 and Bunker Hill operate in only one zone. The customer should purchase the pass or trip ticket with the correct zone for that route; for example, route 437 operates in zone 1 and the customer should purchase a zone 1 pass or trip ticket. If paying with stored value, $2.50 will be deducted. All of the other Commuter Express routes (409, 419, 422, 423, 448, 549, 573, 574) operate in more than one zone. At the beginning of the route the driver sets the validator to the highest zone number for the route, changing as the bus enters each new zone. To ensure you pay the right fare, inform the driver of your destination BEFORE you use your TAP card unless you are traveling to the furthest zone. If you are traveling to the last zone on the route and your Commuter Express pass or ticket or EZ pass matches that zone, simply place your TAP card (either side) close to the validator located by the farebox as you board. You will get a green light if there is a valid pass or trip ticket on the card. If you are NOT travelling to the last zone on the route, you must inform the driver your destination PRIOR to placing the TAP card by the validator. This will avoid you getting a red light because the zone on your Commuter Express pass or Trip Ticket or EZ transit pass did not match the zone set on the validator. The driver will reset the zone to your destination and after indicating the change has been made you will be able to tap your card by the validator. You will get a green or red light with a valid fare. This same procedure must be followed for those who pay with stored value (cash) on their TAP card. Otherwise an incorrect amount may be charged and the driver cannot reverse the charge. I pay with an EZ transit pass. How does that work with TAP? If you are riding DASH, simply place the TAP card by the validator. With a valid EZ transit pass you will get a green light. When riding Commuter Express the EZ transit pass works just like the LADOT 31-Day pass as described in the last question. The EZ transit pass is sold as a pass with the option of adding premium stamps for zones 1-11. The EZ transit pass with no stamp is valid for the Commuter Express base zone only. The premium stamps for zones 1-4 are equal to the Commuter Express zones 1-4. Stamps for zone 5-11 also equal a zone 4 for Commuter Express. I used my TAP card on Commuter Express and the amount deducted from the card was incorrect. How do I get a refund? Please call the TAP Service Center at 866 TAPTOGO (866 827 8646). I ride Commuter Express and transfer to another Commuter Express bus. How should I pay? The easiest way is to purchase a LADOT 31-Day Pass with the number of zones equal to the highest zone you will travel. For example, if you ride in a Base zone then transfer to a bus in zone 2, you purchase the pass with two zones. When you board you simply tap the card each time. If your ride involves different zones for each bus, and you do not want to purchase the 31-Day Pass, then using stored value (cash) is convenient. You would pay with stored value (cash) on the first bus, and purchase an Interagency Transfer with stored value (cash) as well. On the second bus, you would tap the card, and the validator will see the transfer then calculate any additional fare for the added zones. This is all done automatically with the amount deducted from stored value (cash). When you pay with a Trip Ticket and have stored value (cash) on your TAP card, the cost of the Interagency Transfer will be deducted automatically on the second bus. You must have stored value (cash) on your TAP card to buy a transfer. How does the Interagency Transfer work with the Commuter Express zones? The Interagency Transfer is equal to the cost of the Base zone ($1.50 or $0.75). If you have the paper Interagency Transfer the driver of the second bus will ask you your destination and will tell you the additional amount owed. Payment is in cash. If you have the Interagency Transfer on the TAP card, the amount owed will be calculated when you tap the card, and if you have that amount in stored value (cash) it will be automatically deducted. This amount will be based on the farthest zone for that route. If you are not going to the end of the route, you must inform the driver BEFORE you tap the card. The driver will need to reset the zone so you will not be overcharged. Once the driver makes the change you can tap your card. If you do not have enough money in stored value (cash) you need to pay the additional fare in cash. I ride Commuter Express bus and transfer to DASH. What should I do? You will need to have a Commuter Express 31 Day pass or EZ transit pass on your TAP card to transfer to DASH. You can have a Base pass or one with a zone and the transfer will be free. Also, Interagency Transfers are not valid on DASH. There is no free transfer to DASH if you pay the Commuter Express fare with tickets, stored value (cash purse) or cash. I transfer from Commuter Express to Metro rail. What should I do? You will need to have a TAP card and enough stored value (cash purse) on the card for an Interagency Transfer, as the turnstiles in the rail stations will only accept TAP cards. Pay your Commuter Express fare with a TAP card (pass, trip ticket, stored value (cash purse) and ask the driver for an Interagency Transfer. The driver will encode the transfer onto the card and the cost (varies based on the transit service to which you are transferring) will be deducted from the stored value (cash purse) on the card. You cannot pay for the transfer with cash and have your TAP card encoded. I ride Commuter Express and transfer to a Metro bus. What should I do? You can have the transfer encoded onto your TAP card (paying the Commuter Express fare with the TAP card and paying for the transfer with stored value (cash purse). Cash will no longer be accepted as payment for transfers. You can also purchase an EZ transit pass that will allow you to ride any bus service in LA County and all Metro rail lines. I ride Commuter Express and transfer to a bus system that does not have TAP. What should I do? Purchase an EZ transit pass that will allow you to ride any bus service in LA County and all Metro rail lines. How do I transfer from DASH to Metro rail? DASH drivers do not issue transfers so this will be two separate fare payment transactions, one for DASH and one for Metro rail. Can I use stored value on my TAP card to purchase an Interagency Transfer on Commuter Express? What about if I pay cash? When you pay the Commuter Express fare with a TAP card, you can also purchase an Interagency Transfer using stored value (cash purse). The driver will encode the transfer onto the TAP card (you will be asked to tap a second time) and the cost of the transfer will be deducted from the stored value (cash purse) amount on the card. On the second bus simply tap your card on the Validator. You must have stored value (cash) on your TAP card to buy a transfer. You will request (and pay for) your transfer on the second bus (bus you are transferring to) not the first bus you transferred from. Cash will no longer be accepted as payment for transfers. If I pay the fare with an Interagency Transfer can I purchase another Interagency Transfer? Below is a list of LADOT Park & Rides. This list is organized by the LADOT Commuter Express route that services each lot. Park & Ride lots are free to use only if riding transit, and spaces are available on a first-come, first served basis. LADOT offers clean air alternatives with new compressed natural gas or propane powered buses. Just look for this symbol on the buses you ride.